Born in 1981, Damien ARIBERT started his classical guitar studies at the age of 7, first with Evelyne Lacheret and later on with Brigitte Repiton. In 2000, he entered the ‘Ecole Nationale de Musique et de Danse (ENMD)’ in Romans sur Isère, in the class of Gilles Gogniat, where he obtained his degree ‘Diplôme d'Etudes Musicales (DEM)’. From 2004 to 2006, he studied with Emmanuel Rossfelder (the winner of the ‘Victoires de la Musique Classique’ in 2004 and a former pupil of Alexandre Lagoya), and obtained in 2008 his classical guitar teaching state diploma. His very eclectic musical styles inspired him to create various pieces (Editions du Petit Page) ranging from a suite for 4 cellos, as a tribute to the famous Finnish band ‘APOCALYPTICA’, to a romantic jazz-waltz for solo guitar ‘La Rossfelda’, dedicated to Emmanuel Rossfelder (who added the piece to his repertoire). He furthermore composed pieces in the South American music styles (‘Eclipse à Rio’, Editions Soldano), swing, ragtime… to develop a technique of playing inspired by the bassists, unreleased on classical guitar (mix of slap, tapping and percussions). He played at various festivals (Nice Festival 'C'est pas classique', 'Festival Des Vents' in Morières Les Avignon, 'Musiques à Pontorson', 'Les Guitares du Cotentin'...) as well as on different regional and national venues (in Aubagne, Marseille, Pernes les Fontaines, Avignon, La Garde Adhémar, Vénéjan, Valréas, La Baume de Transit, Comps...), which resulted in musical meetings with high quality artists like Per-Olov Kindgren, a Swedish guitarist with international fame. Damien Aribert recorded his CD 'Destinations' in 2014 at the internationally renowned studio ‘La Buissonne’ reputed for acoustic qualities. 2017 was a year rich in awards: he won 1st Prize at the International Competition InterArtia, in the category 'Classical Guitar', for his entire body of work, and won 1st Prize at the Greek International Composition Competition 'Kithara' for his bossa-nova 'Nin-Nin' (the piece had been published earlier in the year in the American magazine 'Classical Guitar’). 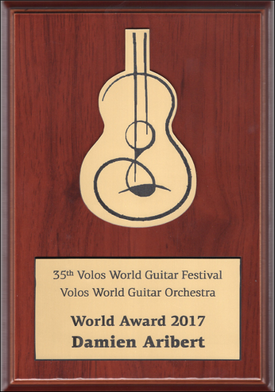 Finally, he won the award for 'Artist of the Year 2017' in the 'Classical guitar' and 'Musical composition' categories, which he received from the 'International Art Society', as part of the 35th International Guitar Festival in Volos, Greece. Success continues in 2018 with Damien winning for the second time in a row 1st Prize for best composition at the Greek International Competition ‘Kithara’, with his bossa nova piece ‘Chouttis’, soon to be published by Editions Soldano. He currently teaches classical guitar at the music school of Avranches-Mont Saint Michel (France) and plays on hand-crafted concert guitars made by the French luthier Renaud Galabert.